This was a recipe I found in a magazine a while back, that is actually a recipe for a chicken pot pie, but as you might imagine, we don’t eat a lot of chicken in this house. Many chicken recipes can be modified to work with rabbit, the main thing is to remember that rabbit is even leaner than chicken and care has to be taken to make sure it doesn’t dry out. This being a slow cooker recipe it promised to be relatively simple and easy and that is what I need most days. It promised to take only about 15 minutes of “active time” so if it turned out okay, this would be a keeper. 1) In 5-6 qt. slow cooker, whisk together wine, flour, 1/2 cup water and 1/2 tsp each salt and pepper. I didn’t have any dry white wine, because I don’t like to drinkdry white wine, so what’s the point of having wine in your house that you don’t like to drink? I used Reisling, which is not as good for cooking and gave the recipe a sweeter taste, but left almost an entire bottle to sip while waiting for the slow cooker to do it’s magic. Win Win! 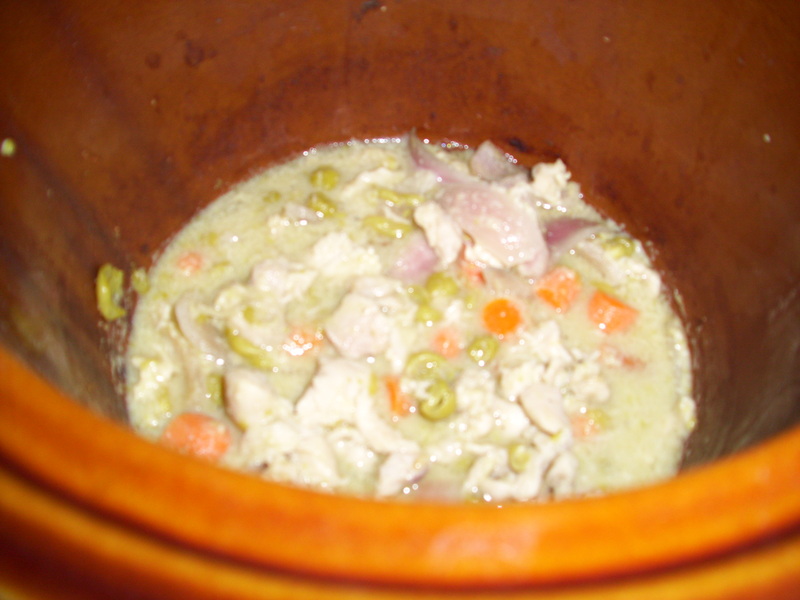 2) Add carrots, celery, onion and chicken and toss to combine. Cook covered, until rabbit is done, 6-7 hours on low, 4-5 hours on high. My crock pot is apparently a little hot, it took 4 hours on low. It was a small amount of filling, though, so that might have made a difference too. Yummers! Smelled pretty good too! 3) When rabbit has 30 minutes left, begin cooking puff pastry according to directions. * I didn’t have any puff pastry, never seen it before in my life, but it sounds yummy. I decided since I didn’t have any, I would use biscuit dough instead, turned out I didn’t have any Grands or Bisquick, so I had to make some from scratch using a great recipe from Grit’s Guide to Baking. I’m sure either of the other options would work just fine, but I like the satisfaction of pummeling the dough into submission making bread from scratch. 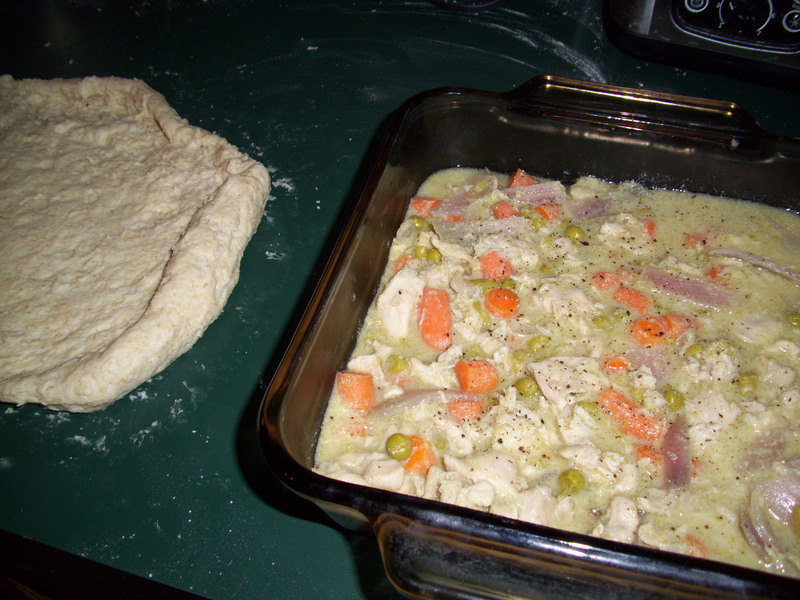 4) When the rabbit mixture was just about done, I poured it into a baking dish and covered it with the dough, and baked it according to the biscuit recipe. Wow! Someone dove in before I could get a picture! One thing I did notice was that the biscuit dough absorbed a lot of the moisture from the rabbit mix, which made it take longer to cook, but wound up with the sopped biscuit dough having a delightful texture and flavor. 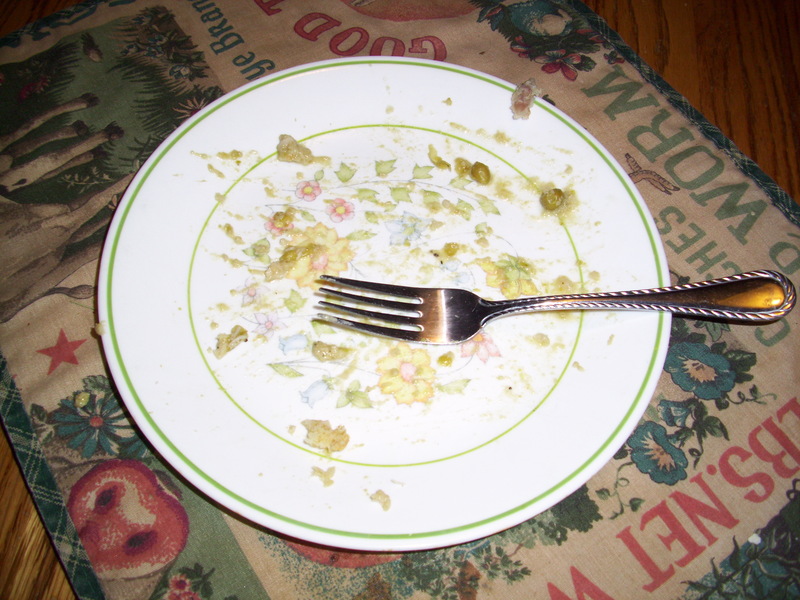 Verdict: Very easy and three clean plates! Notes for next time: Eric said he thought it was missing something. (I forgot the dill!) I think the sweeter wine probably affected the flavor but he also said he thought my Cheddar Parmesan biscuits would have been better. Regardless, this recipe was very easy and came out very nicely, so I would definitely recommend it! Let me know if anyone tries this and how it worked for you! 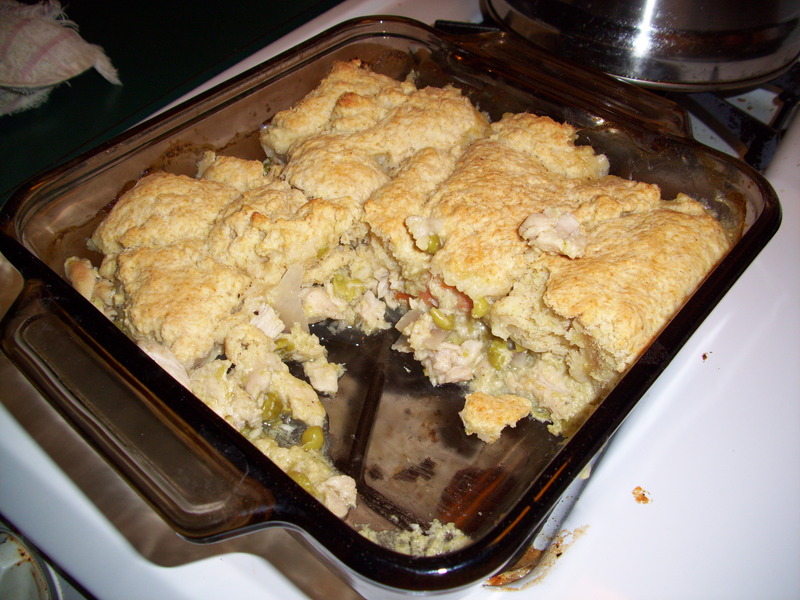 This entry was posted in Recipes and tagged biscuits, cooking, easy recipe, eating well, from scratch cooking, pot pie, rabbit, rare hare barn, recipe. Bookmark the permalink.